Brooklyn's most interesting and notable neighborhoods, providing a mix of information about culture, history, architecture, places to eat, venues to visit, and more. From a walk through the Russian-influenced Brighton Beach, to the expansive Prospect Park, and out to Red Hook, Walking Brooklyn reveals the many layers and sites of Manhattan's lesser-known neighbor. 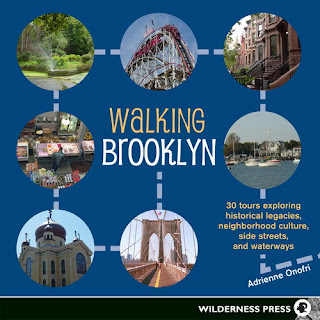 This two-color book features 30 routes, a clear neighborhood map for each walk, black-and-white photographs, and critical public transportation information for every trip. The book is from Wilderness Press and can be ordered here. We see that Ms. Onofri will be guest blogging over at Only the Blog Knows Brooklyn. We look forward to reading.